Could tablecloth and skirting sets be the hospitality accessories you've been looking for? 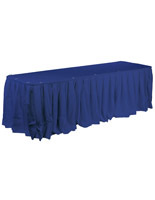 These convenient sets make it easy to decorate for events, wedding, banquets or trade shows. 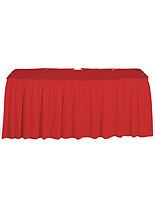 Custom tablecloth and skirting sets come in a variety of colors that form a perfect base for decorations and other accessories. Styles and shades are available to match or complement place settings, runners, centerpieces, sales materials, branded items and more. 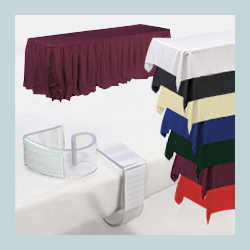 Our tablecloth and skirting sets, also known as clip and cover sets, each include a topper, pleated drape and a set of ten tablecover clips. Each piece can be used separately as needed for party, wedding, conference or other event decorating in addition to together as a stylish and elegant set. Decorative linens are the literal fabric upon which successful gatherings are built, and these versatile kits are a perfect choice for any professional, commercial, institutional, hospitality and residential use. What exactly is included in these clip & cover sets? 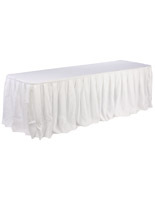 Our economical tablecloth and skirting sets start with base throws that are 54" wide and 120" long (or 4.5' x 10') to easily cover either 6' (72") or 8' (96") tables. 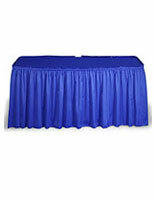 Durable, easy maintenance polyester linens come in a range of colors to match any environment, and the fabric is certified flame retardant for public safety, machine washable and dryer-safe. 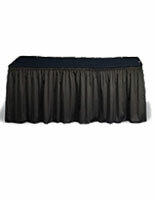 The pleated covers in our hospitality grade clip and cover sets are designed to work in many different configurations. The Velcro-backed accessories are available in three sizes: 13.5' (162") long, 17.5' (210") long and 21.5' (258") long and will provide full or front/side coverings for a wide variety of furniture sizes. The 29.5" drop will reach within an inch of the floor on most standard height conference, event or banquet fixtures. 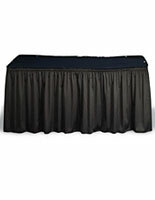 Like our base tablecovers, our skirts for trade show or party use are fire retardant and machine washer and dryer safe. Box pleats and shirring, along with secure Velcro backing for easy attachment to clips, allow the drapes to fully and attractively conceal table bases and allow that space to be used for storage as needed. A clean, clutter-free environment is important at any event or party, from the most elaborate wedding banquet to the largest trade show, conference or meeting. Linens with box pleats or shirring make these custom clip and cover sets a multipurpose decorating accessory. 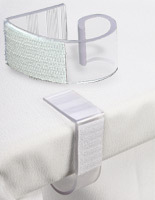 Our tables with covers and clips include ten durable clear acrylic clips with Velcro strips designed to securely attach to the hook-and-look backing on the skirt. 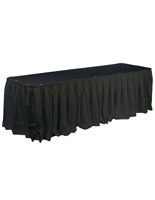 High traffic environments require secure decorating accessories, and these tables with covers & clips keep tabledressing in place even at the busiest events. 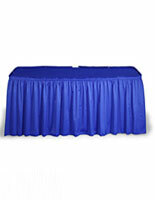 Our trade show and party linen sets come in a variety of colors, sizes and styles including box pleats and shirring. Each custom kit includes a throw, cover and furniture clips. The multipurpose accessories are durable enough for years of continued use, and can go from trade show to conference to social function with ease. The skirts with shirring or box pleats provide full coverage for fixtures to within an inch of the floor, and the throws fully cover six to eight foot tables with ease. 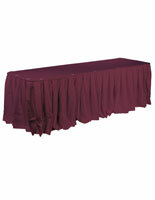 Versatile, safe and attractive custom decorating for any function is a snap with this type of accessory.